Why does tuberculosis, a disease which is both curable and preventable, continue to produce over 50,000 new cases a year in South Africa, primarily among blacks? 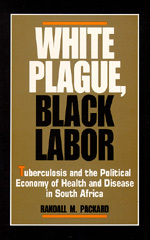 In answering this question Randall Packard traces the history of one of the most devastating diseases in twentieth-century Africa, against the background of the changing political and economic forces that have shaped South African society from the end of the nineteenth century to the present. These forces have generated a growing backlog of disease among black workers and their families and at the same time have prevented the development of effective public health measures for controlling it. Packard's rich and nuanced analysis is a significant contribution to the growing body of literature on South Africa's social history as well as to the history of medicine and the political economy of health. Randall M. Packard is Asa G. Chandler Professor and Chair of the History Department at Emory College. He is the author of Chiefship and Cosmology.